One of the most common methods of moving a load from point A to point B is through linear translation of a motor by a mechanical lead screw and nut. This section is here to assist and refresh your understanding of the basic principles of lead screw technology prior to selecting the system that is best for your application. Please also reference the Glossary (page 85 of the catalog) to support your understanding. What is the load of your system? What is the required speed to move from point A to point B? What is the distance to be travelled? What is the required time to move from point A to point B? What accuracy does your application require? What repeatability does your application require? Pitch is the axial distance between threads. Pitch is equal to lead in a single start screw. There may be more than one thread “strand” on a single screw. These are called starts. Multiple start lead screws are usually more stable and efficient at power transmission. on of the screw. Throughout this catalog, lead will be the term used for specifying a screw as it is the linear distance travelled for one revolution of the screw. The larger the lead, the more linear distance travelled per one revolution of the screw. Typically quantified as either lbs OR kg to move or pounds force (lbsF) or kgF for thrust. Typically quantified as either inches/second (mm/sec) required for your application. Typically quantified as either inches or mm, is the required move distance. Typically quantified in seconds. Time period required for a given distance defines the velocity, acceleration (A), and deceleration needed to reach commanded position. Vertical orientation applications add the potential problem of backdriving when power to the motor is off and without an installed brake. Vertical applications also have an additional gravity factor that must be part of the load/force calculation. Specified as a measurement over a given length of the screw. For example: 0.0006 in per inch. Lead accuracy is the difference between the actual distance travelled versus the theoretical distance travelled based on the lead. For example: A screw with a 0.5 inch lead and 0.004 inch per foot lead accuracy rotated 24 times theoretically moves the nut 12 inches. However, with a lead accuracy of 0.004 inch per foot, actual travel could be from 11.996 to 12.004 inches. The amount of “wobble” around the centerline of the screw. Most motion applications put the most significance on the repeatability (vs accuracy of screw) of a system to reach the same commanded position over and over again. For example: A repeatability of ± 0.005 inch means that after repeated commands to reach the same target position, the linear error will be no more than ± 0.005 inch. A load that tends to stretch the screw is called a tension load. A load that tends to “squeeze” or compress the screw is called a compression load. 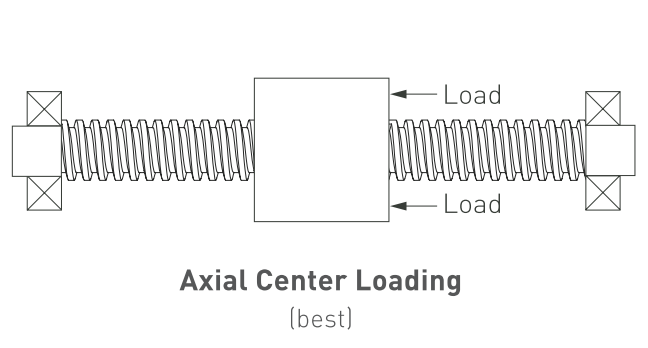 Depending on the size of the load, designing the screw in tension utilizes the axial strength of the screw versus column loading. A load perpendicular to the screw. This is not recommended unless additional mechanical support such as a linear guide is used. A load that exerted at the center line of the lead screw. The maximum thrust load, including shock load, that should be applied to a non-moving screw. The maximum recommended thrust load which should be applied to the screw while in motion. Backdriving is the result of the load pushing axially on the screw or nut to create rotary motion. Generally, a nut with an efficiency greater than 50% will have a tendency to backdrive. Selecting a lead screw with an efficiency below 35% may prevent backdriving. The smaller the lead, the less chance for backdriving or free wheeling. Vertical application are more prone to backdriving due to gravity. The nut material contains a self-lubricating material that eliminates the need for adding a lubricant to the system. The Teflon coated screw option also lowers friction and extends life of the system. Standard metric or English options are available. Custom end machining specifications are also available on request. The performance (speed and efficiency) of the screw system is affected by how the screw ends are attached and supported. When a screw is loaded in compression, its limit of elastic stability can be exceeded and the screw will fail due to bending or buckling. For example, the following chart shows that for a screw with a 3/4 inch diameter and 70 inch length, the threshold for critical speed is 700 RPM. Backlash is the relative axial movement between a screw and nut at standstill. It is normal for backlash to increase with wear over time. Backlash compensation or correction can be accomplished through the application of an anti-backlash nut. Backlash is usually only a concern with bi-directional positioning. WHY CHOOSE ONE FORM FACTOR OVER THE OTHER? What is the best mechanical fit for your application? How do you plan to attach the screw? Is rotation of the screw acceptable? Does your application require an encoder or brake? What is the stroke of your application? WHAT ENVIRONMENTAL CONSIDERATIONS DO YOU HAVE? DINGS’ Motion USA linear motion systems are designed to operate in dry and non-corrosive environments. Standard products do not have an IP rating. Operating non-IP rated linear systems in dirty or corrosive environments will significantly reduce product life. Very high or low temperatures may cause significant changes in nut fit or drag force. Each NEMA frame size motor has a mechanical load maximum that should not be exceeded. For more information, see Speed/Force curves for the individual frame sizes. In order to select the right motor/lead screw combination with the lead screw, several factors should be considered:1. How much force is required? What is the desired step angle? Detent or holding force requirements? What type of driver (amplifier) are you using? To reduce complexity and cost of a design, it is important to accurately size a motor/lead screw combination. Below are a few simple steps in selecting the necessary components for a given application. As the NEMA size of the motor is increased, the output thrust of the actuator is consequently increased. After estimating the required thrust and choosing a NEMA size that may fit your application, the speed and acceleration of the load must be considered and evaluated to choose an appropriate screw lead. Due to the nature of lead screws, the output speed and output thrust achievable by a motor/lead screw combination are two inversely proportional variables (i.e., increasing the required thrust will lower the achievable speed for a motor/lead screw combination). Therefore, the maximum output force of a system is lowered for applications that require higher speeds. For complete motor/lead screw selection data, please refer to the speed/thrust curves for each NEMA size. Because of the numerous variables involved in motor selection, it is highly recommended for users to proceed with physical testing to accurately determine the motor/lead screw combination required for a given application. NOTE: Although this section aims to provide a rough guide to selecting a motor/lead screw combination that best fits an application, we recommend contacting our application engineering staff for further assistance with the motor selection process. There are generally two widely used movement profiles. Depending on the required travel time and distance, different movement profiles can be used. The area under the curves below is the minimum stroke of the linear actuator, its required travel. Hybrid Step Motors combine the best characteristics of variable reluctance and permanent magnet step motors. Because they exhibit high static and dynamic torque and run at very high step rates, Hybrid Step Motors are used in a wide variety of industrial applications. Hybrid Step Motors are highly precise, digitally controlled motors that are able to provide years of reliable operation. The operation of the motor is controlled through electrical pulses. The direction of current flowing through the windings of the motor is switched with each pulse. The electrical pulse is converted into shaft rotation in steps of a fixed angle. Together with the driver, it constitutes an open loop system, which is cost effective and simple to construct. Hybrid Step Motors, as a result of the way they are constructed, are inherently lower cost than servo motors. Step motor systems do not require tuning, allow for greater inertia mismatch and have a very high torque density. This torque is 100% available immediately upon startup which can be very advantageous when doing short quick moves or when coupled with high inertia loads. Because step motors are synchronous motors with a high pole count, they are able to run smoothly at extremely slow speeds with little torque ripple. These precise, highly reliable motors are applied in thousands of applications in industries such as medical, lab automation, electronic assembly, and packaging. Popular for decades, these systems will continue to be a popular choice among design engineer. All motors in this catalog are Bipolar. Bipolar motors have a single winding per phase. The current in the winding needs to be reversed in order to reverse a magnetic pole. Therefore, the driving circuit is more complicated and typically utilizes an H-bridge arrangement. Because windings are better utilized, they are more powerful than a Unipolar motor of the same size. A Unipolar motor has twice the amount of copper wire in the same space, but only half is used at any point in time, hence it is 50% efficient. Bipolar chopper drives are by far the most widely used drivers for industrial applications. Although they are typically more expensive to design, they offer high performance and high efficiency. They also use a four transistor bridge with recirculating diodes and a sense resistor that maintains a feedback voltage proportional to the motor current. The motor performance curves in this catalog were developed using a Bi-polar chopper drive. Measured by accelerating the motor to the desired speed and then increasing the torque loading until the motor stalls or missed steps. This measurement is taken across a wide range of speeds and the results are used to generate the dynamic speed / torque curve. This curve is affected by drive voltage and drive current. All performance curves in this catalog are generated using this method. Approximately ± 3 arc minutes (0.05 degree) This error does not accumulate from step to step. When a standard 1.8 degree step motor travels one step is will go 1.8 degree ± .05 degree. If the same motor travels one million steps, it will travel 1, 800,000 degrees ± .05 degree. The error does not accumulate. Step motors are rated with a varying degree of inductance. A high inductance motor will provide a greater amount of torque at low speeds and lower torque at higher speeds. PHASE RESISTANCE (OHMS) The motor‘s terminal resistance value specified at the the hot winding, which is the motor‘s maximum rated temperature. The maximum torque that can be externally applied to the stepper motor shaft without causing continous rotation when one or more phases of the motor are energized. The torque required to rotate the motor‘s output shaft with no current applied to the windings. RADIAL LOAD A load exerted perpendicular to the motor shaft (should be minimized). How much torque is required? DINGS‘ linear motion systems are designed to operate in dry and non-corrosive environments. Operating the motor in dirty, corrosive, or extremely high temperature environments will significantly reduce product life and may void warranty. Using the Product Selection System along with the associated Nema motor frame size pages in the next sections, you will then be able to drill down to specific part numbers for your step motor choice. Based on Standards Established by the National Electrical Manufacture‘ Association (NEMA). The size of motor is established by overall dimension of motor flange. For example, a NEMA 23 motor measures approximately 2.3 inches square at the mounting flange. The Hybrid Step motor is the most widely used and combines the principles of the permanent magnet and the variable reluctance motors. 2, 3 or 5 phase. 2-phase is the most common. The potential advantages offered by a 5-phase motor are higher resolution, lower acoustic noise, lower operational resonance, and lower detent torque. The 3-phase motor offers a middle course between the 2-phase and 5-phase step motor. Determined by the # of rotor cups or stacks. Added stacks and length = more torque, but at a tradeoff. Depends on the application; for example, a longer motor has higher slow speed torque but at the expense of quick response and higher speeds. Rotor inertia also increases with longer motors. The higher the current / phase the more performance. The motor driver (amplifier) may also determine which current to choose. Step motors typically come with 4, 6, or 8 wire leads. With bipolar driver, there are 4 connections to a motor. Wiring up a 4 lead motor is straightforward. 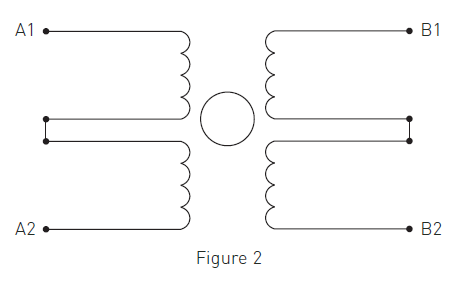 When using motors with 8 leads, the coils can either be connected in series or parallel. A series connection provides a higher inductance and therefore greater performance as low speeds. 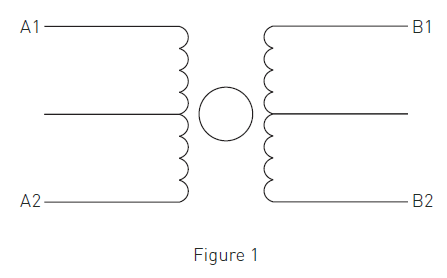 A parallel connection will lower the inductance but increase the torque as faster speeds. If it necessary to confirm position attained back to the motion controller, an encoder will be required. The resolution (or line count) of the encoder will be dependent on the application. A 1,000 line encoder, with quadrature, provides a 4,000 count resolution. In addition, a single ended electrical connection or differential are available. A differential encoder option is recommended for longer encoder cables and/or high noise environments. DINGS‘ can provide a custom configuration to your specification. This can include special windings, connectors, wire leads, and mechanical modifications to both the front and rear shaft. Contact your local technical distributor for quotation.